One of my fondest teenage memories is going running with my Dad. I loved these evenings until one day something terrible happened- he hurt his knee. Without his regular running, my dad has gained weight and has developed high blood pressure. I have been looking for a way to help him since then. The other day, I heard about using a knee brace after ACL surgery. I started looking for the best knee brace for torn ACL which could help my Dad to overcome the pain and also support him not only daily activities but also sports. Here is what I found. I would have to say the Winzone Knee Brace support struck me as the ideal knee brace for anyone with a torn ACL. Unlike many knee braces that usually hinder your ability to use your knee fully, this knee brace provides support while giving you flexibility. A knee brace should be firm enough to keep your knee stabilized, but not so much that it limits mobility. The brace is made from genuine materials and has the ideal amount of thickness. In addition, it can accommodate a wide range of knee measurements. Since my dad has a big build but small knees and legs, the Winzone brace has a great design since it follows the knee and legs natural outline. This gives it a perfect fit without adding too much weight. If you are looking for a knee brace that allows more adjustability, the TechWare Pro Knee Brace is a good option to consider. One of the first things I noticed about the brace is that it has bidirectional support. This allows you to fasten the center strap in one direction while fastening the other straps in the opposite direction. Such adjustability can help tailor the amount of support to your needs. Like the Winzone Knee brace, it also uses neoprene material. This means that it offers great breathability and comfort. The alternating Velcro strap system along with the comfortable material makes it one of the most functional knee braces. If you find the WInzone knee brace lacking in adjustability, I would recommend you purchase this one as an alternative. Also, if you only have a minor knee injury or problem and need support for daily activities, I would suggest you go for this brace. Inasmuch as I would love to splurge on a knee brace, I was afraid my pocket could not afford it. I came across the Sable Knee brace support which costs about 10USD on Amazon. Considering the low cost, I was assuming the worst but was pleasantly surprised. The Sable knee brace has a wider coverage compared to the previous two braces stretching above and below the knee. This equal pressure distribution offers a higher level of protection. I also noticed that the brace is worn like a sock and simply pulled up to the knee. This removes the problem of adjustability as is the case with most knee braces with Velcro straps. During my research, I discovered that there are some products that have very good quality. However, the best quality also come along with a high price. These products are widely prescribed by orthopedics and also receive a lot of reviews. If I don't have problem with budget, I will sure to choose this for my Dad. Bauerfeind GenuTrain knee support is made in Germany and costs up to 100USD and provides support for cartilage injuries, knee ligament injuries, and mild arthritis. The knitted material used is lightweight and washable making it very comfortable to wear. I was also impressed by the silicone omega pad which fits over the kneecap to reduce pressure while gently massaging your knee. Unlike other braces that easily slide down, the Bauerfeind does not slide. In addition, the knee brace comes in wide size ranges. 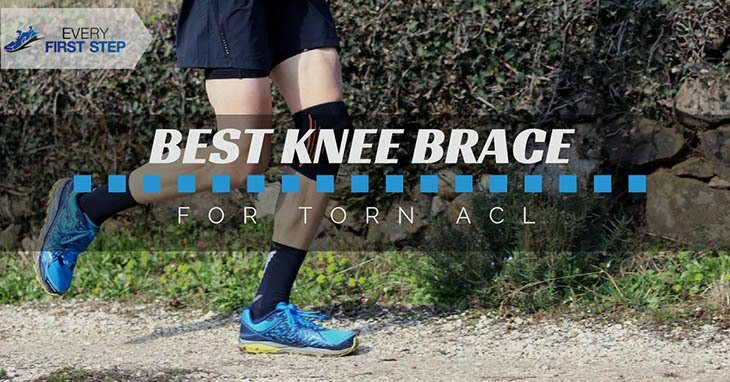 Although regular knee braces are great when you are fully recovered and ready to get back to running, they will not work if you still have swelling or pain. This got me wondering whether there was a way to combine the compression of a knee brace with the pain relief of ice and I found what I was looking for. Cold One knee ice pack is recognized by orthopedics to relieve pain and inflammation from knee injuries such as ACL. The product freezes after about 90 minutes in the refrigerator and can then be applied to the knee for up to 20 minutes to help reduce pain and swelling. I found the whole idea of combining a knee brace with an ice pack amazing. I can still remember watching my dad try all sorts of positions with an ice pack to try and get it to balance on his knee. With the Cold One knee Ice pack, you don't have to hold the ice pack down on your knee. The cold and compression together help alleviate pain and lower inflammation to promote fast healing. Seeing my Dad suffer after tearing his ACL has taught me one important lesson-prevention is better than cure. I cannot imagine not being able to run for so many years just because of a single injury. Fortunately, there are ways that you can prevent ever going through such a traumatic experience. Considering the fact that the ACL ligament is slightly elastic, it can easily tear partially. According to statistics, women are 4-6 times more likely to get an ACL injury. (2) One reason is we have wider hips than men which may affect the alignment of the knee. In addition, the concentrations of hormones such as estrogen and relaxing are different in women. Both these hormones contribute to the strength and flexibility of the muscles. Jump upward in a straight vertical line and land with your feet and knees pointing straight ahead. The basic rule when jumping is never to allow your knees to turn in. I am so happy I decided to do some research about the best knee brace for a torn ACL. I can't wait to order the Winzone Knee Brace support for my Dad. I love that it is affordable and firm enough to support your knee while allowing you to remain mobile. The TechWare Pro would have been my choice if it were a minor injury. The Bauerfeind GenuTrain Knee support seemed to be a good option if it weren’t for the high price. I loved the knitted material it is made of. I’ll also probably get a Cold One knee ice pack in case my Dad suffers swelling when he gets back to running. Although all the products I reviewed have their pros and cons, if you are looking for something that is a good combination of quality and affordability, the Winzone Knee Brace support is the best option. The brace follows the knee and legs natural outline making it ideal for a wide range of knee measurements. It also doesn’t have the additional weight of pads that is common in other knee braces. Overall, it is lightweight and yet stable- two qualities which someone recovering from an ACL injury need to consider. After all this reviewing, all that’s left for me to do is have the brace delivered to my Dad’s door. I can’t wait to see the look on my Dad’s face when I give him his brace and tell him he can go running again. Running after ACL surgery is possible as long as you take things one step at a time. I came across this article on how to get back to running after surgery. Make sure to check it out. Do you know anyone who has had an ACL injury before? Have you? How did it affect your running? What did you do about it? I’d love to hear all your amazing experiences about using a knee brace. Please share your thoughts in the comments below.